The fifth issue of the FAO/WFP update for the United Nations Security Council (UNSC) provides United Nations Security Council (UNSC) members with an overview of the magnitude, severity and drivers of acute food insecurity in eight countries and regions that have the world’s highest burden of people in need of emergency food, nutrition and livelihood assistance as a result of protracted conflict combined with other factors. The situation in the eight places in the world with the highest number of people in need of emergency food support shows that the link between conflict and hunger remains all too persistent and deadly, according to a new report released by the United Nations’ Food and Agriculture Organization (FAO) and the World Food Programme (WFP). 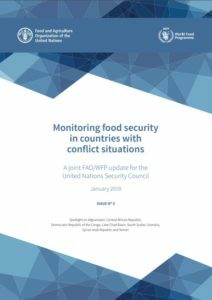 The report was prepared for the UN Security Council which in May adopted a landmark resolution on preventing hunger in conflict zones. “This report shows again the tragic link between conflict and hunger and how it still pervades far too much of the world. We need better and quicker access in all conflict zones, so we can get to more of the civilians who need our help. 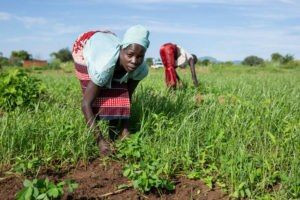 But what the world needs most of all is an end to the wars,” the World Food Programme Executive Director David Beasley states in the foreword. In the second half of 2018, the Democratic Republic of the Congo had the second highest number (13 million) of acutely food insecure people, driven by a rise in armed conflict. In South Sudan, where civil strife has persisted for more than five years, the lean season is expected to start earlier than normal, according to the report, pushing those in need of urgent support up to more than 5 million between January and March 2019.